If you need a contract printer with the right services so that you can start decorating garments with bling then you’ve discovered just the place: AMBRO Manufacturing! AMBRO Manufacturing is a contract apparel customization company with over 30 years in business so we have so many garment decoration options to choose from. You don’t need any special qualifications to get started so you could begin decorating garments with bling starting today! 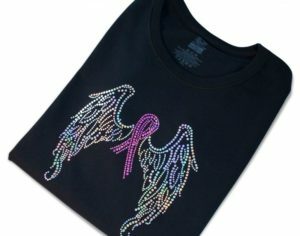 Since we have many services to select from you have several choices when it comes to decorating garments with bling, it just depends on how flashy you want your art to be. For example, you could try custom glitter printing where we use sparkly glitter flakes mixed in with inks to create gorgeous shimmer effects. Another great option is custom foil printing where we use sheets of metallic foil to apply to your custom printed artwork. The foil adheres only to where we print the adhesive ink so you can partially or completely foil out a design to add a whole new level of luster. If you really want to pump up the volume when decorating garments with bling you can try out custom spangle transfers. Spangles are like rhinestones or sequins but they are perfectly flat and they’re not sewn on nor have little holes in the middle. So they’re just as shiny but they feel smooth to the touch and they’re a snap to apply. You don’t have to take our word for it though because you can begin exploring your options for decorating garments with bling easily by reaching out to one of our representatives who can show you the way. You can easily contact us to place an order, or to find out more about our company and all of the customization services we have to offer, by email or by giving us a call at (908) 806-8337.